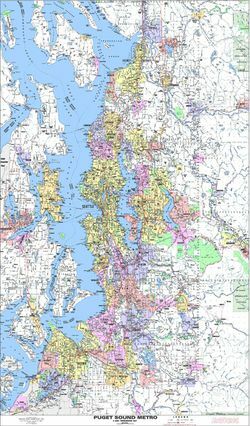 This Puget Sound arterial map provides a detailed overview of the main thoroughfares, cities, highways, interstates, unincorporated place names, parks, golf courses, and much more. Careful text placement and an attractive color scheme only enhance the accuracy of these maps from local publisher, Kroll Map Company. This map covers from Marysville to Tacoma, and from Bremerton to North Bend. Item Number Size / Paper or Laminated Price Qty.